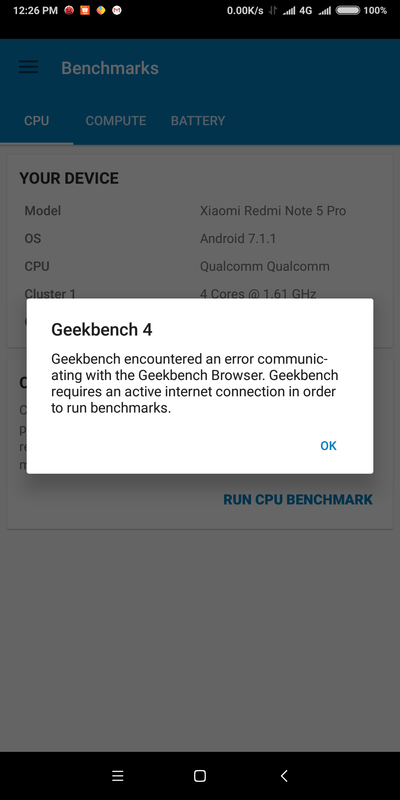 Using my new Oppo A75 and trying to run Geekbench but getting an issue of "Geekbench encountered an error communicating with the Geekbench Browser. Geekbench requires an active internet connection in order to run benchmarks." Thanks for letting us know about this, and I'm sorry for any trouble caused by this issue. This is quite unusual behaviour. Could you let me know what version of Geekbench 4 (e.g. 4.2.0) and what operating system version you're using so that we can take a closer look? Also, could you let me know if you're using any ad-blocking apps or browser plugins on your Oppo A75? One user did encounter a problem where their ad-blocking software was preventing Geekbench 4 from accessing the internet, and whitelisting Geekbench resolved the problem. Thank you for following up with me. I'll pass this information along to my team and let you know as soon as I can if we can provide more information or an update to resolve this. I'm sorry for not addressing your concern in my previous comment in this thread -- our spam filter was acting a bit overzealously, and I didn't immediately see your comment. I've followed up with you in your other thread here. I am also getting same problem with my new Nokia 5.1 plus. Please provide me with further information. Thanks for letting us know. Are you able to access the Geekbench Browser in your default browser on Android? I will let the team know about this and I'll post here if I have any updates for you. Yes I am able to connect with geekbench browser in my default browser. I'm also with this Nokia and unable to use Geekbench. Do you guys have any update about this issue? Unfortunately we do not have any updates on this issue. As soon as we do, we will post here to let you know. Thanks for your patience. Have you been gathering Logs? If you need some, I can send it to you. I'm a blogger and I would like to test this Nokia in your benchmarks. Im sorry, but the email was blocked. I believe you can see my email. Just send me the email you try to put in there over my email. I use tha last version of app Geekbench 4_4.3.2.apk.